American law enforcement and intelligence agencies intercepted the communications around the same time that they were discovering evidence that Russia was trying to disrupt the presidential election by hacking into the Democratic National Committee, three of the officials said. The intelligence agencies then sought to learn whether the Trump campaign was colluding with the Russians on the hacking or other efforts to influence the election. But the intercepts alarmed American intelligence and law enforcement agencies, in part because of the amount of contact that was occurring while Mr. Trump was speaking glowingly about the Russian president, Vladimir V. Putin. At one point last summer, Mr. Trump said at a campaign event that he hoped Russian intelligence services had stolen Hillary Clinton’s emails and would make them public. The officials said the intercepted communications were not limited to Trump campaign officials, and included other associates of Mr. Trump. On the Russian side, the contacts also included members of the Russian government outside of the intelligence services, the officials said. All of the current and former officials spoke on the condition of anonymity because the continuing investigation is classified. As part of the inquiry, the F.B.I. is also trying to assess the credibility of information contained in a dossier that was given to the bureau last year by a former British intelligence operative. The dossier contained a raft of salacious allegations about connections between Mr. Trump, his associates and the Russian government. It also included unsubstantiated claims that the Russians had embarrassing videos that could be used to blackmail Mr. Trump. The F.B.I. has spent several months investigating the leads in the dossier, but has yet to confirm any of its most explosive allegations. 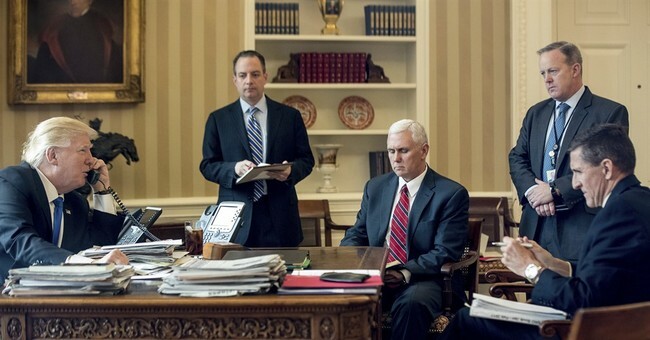 With the Michael Flynn fiasco about to embroil the Trump White House, let’s also look at another aspect that ties these two stories together: the leaks. Flynn misled the vice president and for that he needed to go. Guy wrote about the allegation that Obamaites actually had a prolonged campaign to unset Flynn due to his staunch opposition to the Iran Deal. It seems like his own conduct in this matter ended his tenure in the Trump administration, not to mention there were other principals in the Obama administration who were privy to the details that Flynn threatened to go public with—and those people, as Guy noted, have called for a tough response to Iran’s serial cheating and violation since agreeing to this shoddy agreement. Representative Devin Nunes, the Republican chairman of the House Permanent Select Committee on Intelligence, told me Monday that he saw the leaks about Flynn's conversations with Kislyak as part of a pattern. "There does appear to be a well orchestrated effort to attack Flynn and others in the administration," he said. "From the leaking of phone calls between the president and foreign leaders to what appears to be high-level FISA Court information, to the leaking of American citizens being denied security clearances, it looks like a pattern." In normal times, the idea that U.S. officials entrusted with our most sensitive secrets would selectively disclose them to undermine the White House would alarm those worried about creeping authoritarianism. Imagine if intercepts of a call between Obama's incoming national security adviser and Iran's foreign minister leaked to the press before the nuclear negotiations began? The howls of indignation would be deafening. In the end, it was Trump's decision to cut Flynn loose. In doing this he caved in to his political and bureaucratic opposition. Nunes told me Monday night that this will not end well. "First it's Flynn, next it will be Kellyanne Conway, then it will be Steve Bannon, then it will be Reince Priebus," he said. Put another way, Flynn is only the appetizer. Trump is the entree. These leaks are an enormous problem. And in a less polarized context, they would be recognized immediately for what they clearly are: an effort to manipulate public opinion for the sake of achieving a desired political outcome. It's weaponized spin. This doesn't mean the outcome was wrong. I have no interest in defending Flynn, who appears to be an atrocious manager prone to favoring absurd conspiracy theories over more traditional forms of intelligence. He is just about the last person who should be giving the president advice about foreign policy. And for all I know, Flynn did exactly what the anonymous intelligence community leakers allege — promised the Russian ambassador during the transition that the incoming Trump administration would back off on sanctions proposed by the outgoing Obama administration. In a liberal democracy, how things happen is often as important as what happens. Procedures matter. So do rules and public accountability. The chaotic, dysfunctional Trump White House is placing the entire system under enormous strain. That's bad. But the answer isn't to counter it with equally irregular acts of sabotage — or with a disinformation campaign waged by nameless civil servants toiling away in the surveillance state. No one is saying leaks are abnormal. Leaks happen in every White House, but these have a special flavor to them. I agree that Flynn needed to go—but the second layer to this concerning the targeted leaking of sensitive material to claim scalps or disrupt this White House from governing is probably more worrisome than unsubstantiated dossiers and allegations of Russian hacking. We can’t verify the claims (dossier). And there is no evidence of Russian hacking, even the Obama White House accepted the results and noted that the Department of Homeland Security saw no spikes in malicious cyber activity on election night. We do, however, have evidence that someone is leaking highly sensitive intercepts to undercut this administration. Elections have consequences. Trump won. Clinton lost. Those in the electorate and the government need to deal that there’s a new sheriff in town. If they don’t like it, well, they have to wait until 2020 to vote Mr. Trump out of office. That’s how our constitutional republic works.